Yesterday Ben Myers broke the news of Jefferson Parish Inspector General David McClintock’s first report since he founded the Jefferson Parish Inspector General’s Office and man is that report a doozie. I chucked at George Amato’s comment to Ben’s story, which I completely concur. 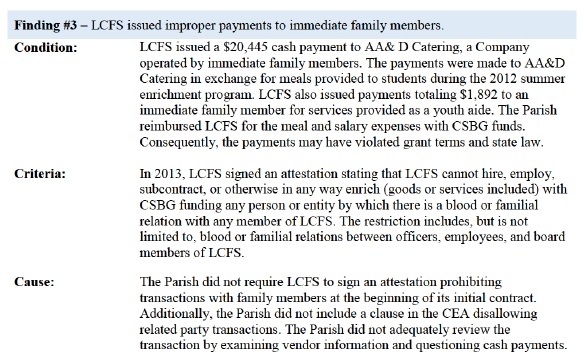 OIG Audit Finding Louisiana Community & Family Services, Inc. The Jefferson Parish Council will meet this Wednesday, April 30th at 10 a.m. on the West Bank at the General Government Building in Gretna. 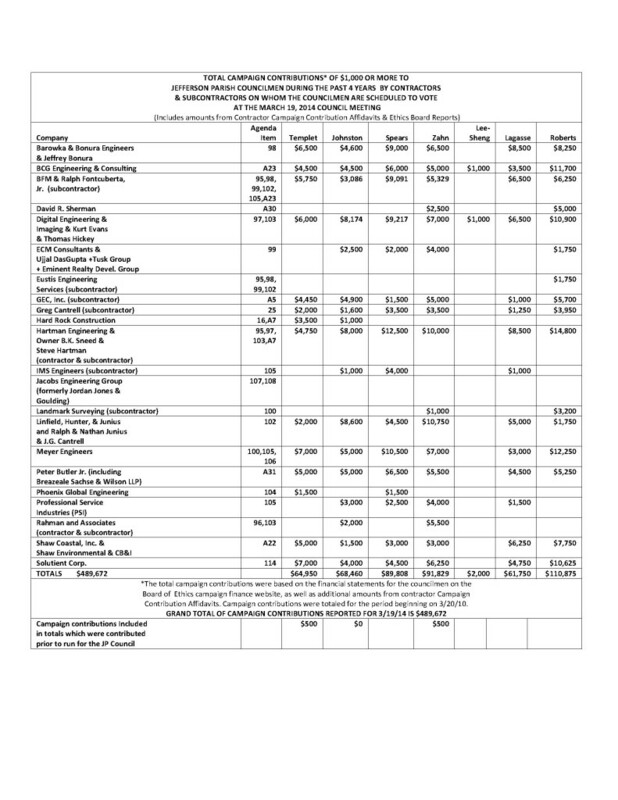 Citizens for Good Government will again present summary information from our Campaign Contribution Table shown below. 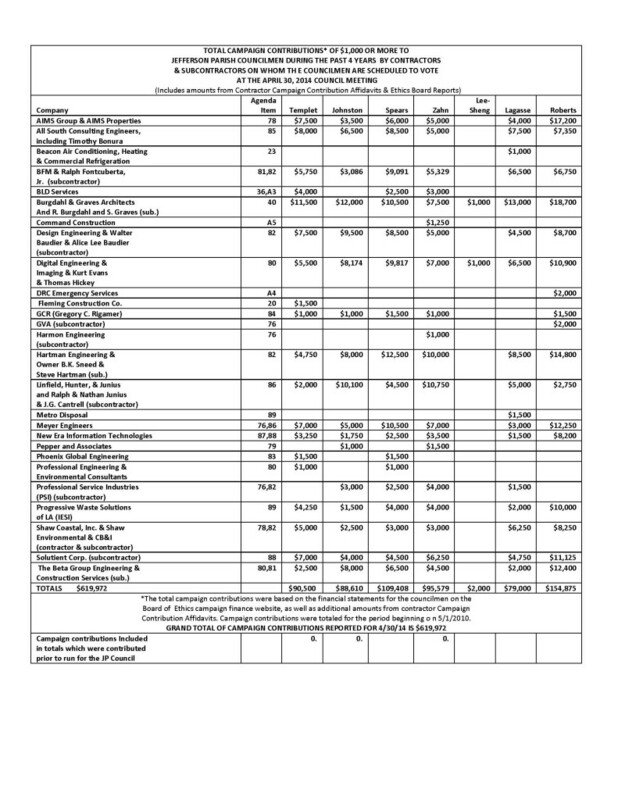 Total campaign contributions of $619,972 were made during the past four years to our councilmen by contractors and subcontractors on whom the councilmembers are scheduled to vote at the April 30th council meeting. The Jefferson Parish Council will meet this Wednesday, April 9th at 10 a.m. on the East Bank in the Yenni Building. Citizens for Good Government will once again present summary information from our Campaign Contribution Table shown below. Total campaign contributions of $347,672 were made during the past four years to our councilmen by contractors and subcontractors on whom the councilmembers are scheduled to vote at the April 9th council meeting. With campaign contributions of $92,675, Councilman Chris Roberts was once again the councilman with the largest amount of campaign contributions, while Councilman Ben Zahn was in second place with $59,579 in campaign contributions. 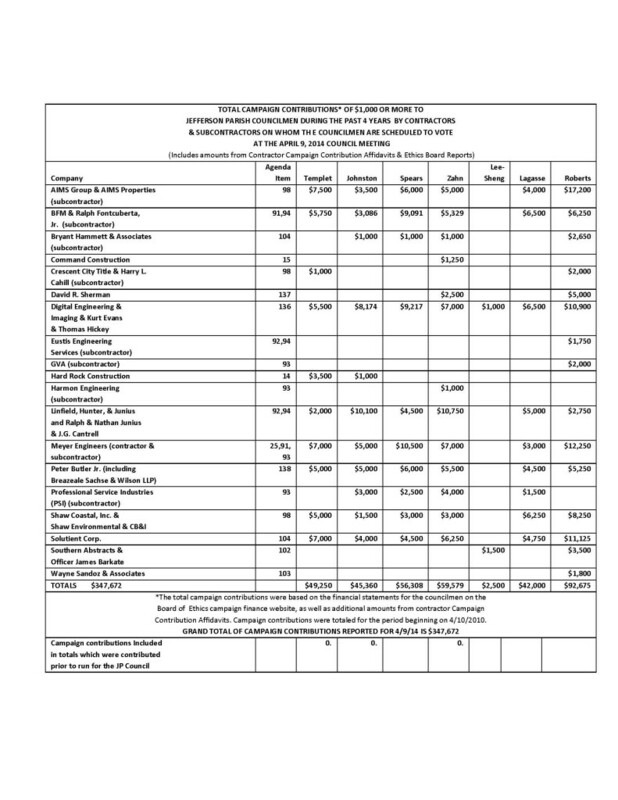 The total campaign contributions made to all seven council members during the past four years by contractors and subcontactors on whom they are scheduled to vote at the April 9th council meeting was $347,672. 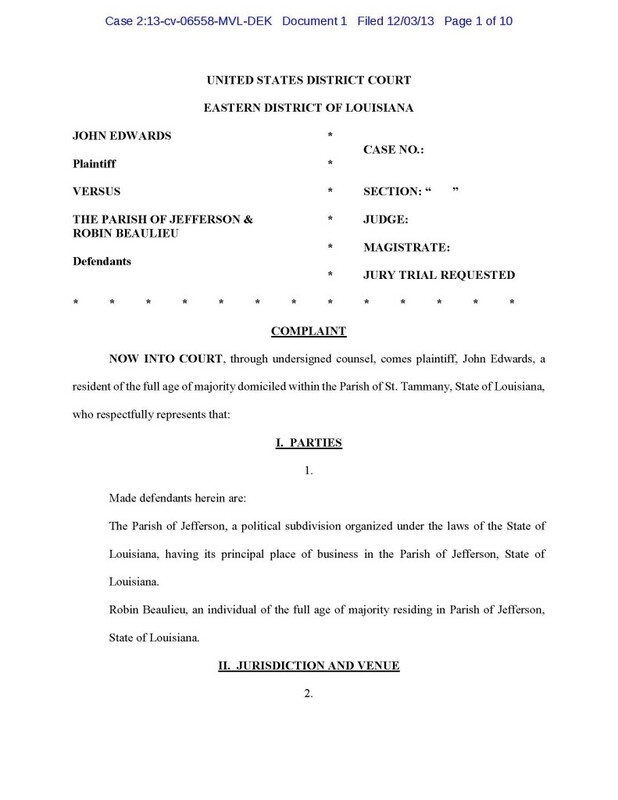 Citizens for Good Government was disappointed that the ordinance to limit the ability of the Jefferson Parish Inspector General to conduct his investigations has been deferred until the April 9th council meeting. CFGG Chairman Margaret Baird and I both expressed our disappointment at the March 19th council meeting about the deferral of this ordinance, since we wanted it to be cancelled or defeated. The objectionable ordinance would require Inspector General David McClintock to provide written requests in order to obtain information from our government, although our Code of Ordinances currently permits him unrestricted access to this information without such a request. Unfortunately, among other things, such written requests would alert the objects of his investigations and would make him ineffective. Louisiana Inspector General Stephen Street and New Orleans Inspector General Ed Quatevaux both agree that it is important for our IG to have direct and unlimited access to this information, as does President Raphael Goyeneche of the Metropolitan Crime Commission. We want to thank profusely all of those who called the councilmembers and urged them to vote NO on this terrible ordinance. By the way, three councilmen have publicly expressed their intention to vote NO on the ordinance: Chris Roberts, Ricky Templet, and Elton Lagasse. Councilman Lagasse’s aide came to the Inspector General meeting with the Ethics and Compliance Commission last Wednesday night, which was attended by Citizens for Good Government, and she announced that Councilman Lagasse was planning on voting NO. The Jefferson Parish Council will meet this Wednesday, March 19th at 10 a.m. on the West Bank at the General Government Building in Gretna. 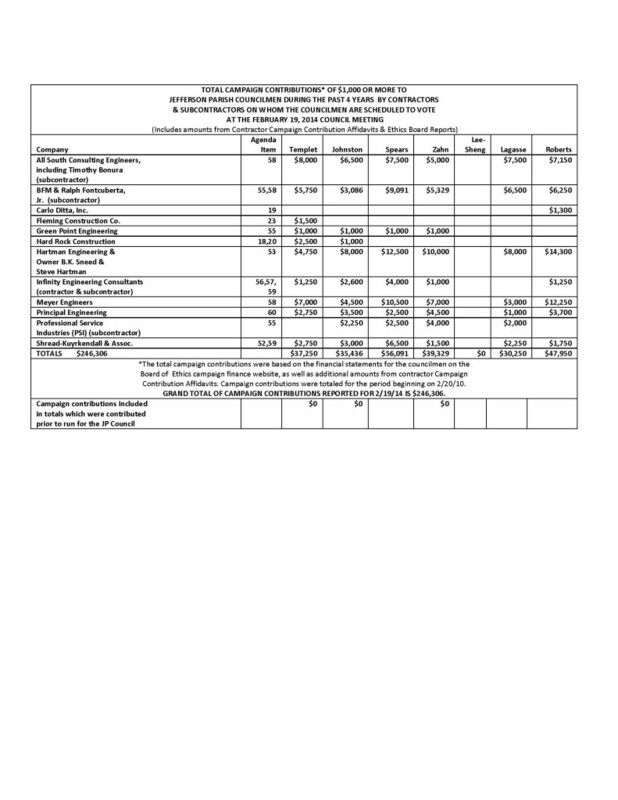 Citizens for Good Government will again present summary information from our Campaign Contribution Table shown below. Total campaign contributions of $489,672 were made during the past four years to our councilmen by contractors and subcontractors on whom the councilmembers are scheduled to vote at the March 19th council meeting. The Jefferson Parish Council will meet this Wednesday, February 19th at 10 a.m. on the East Bank in the Yenni Building. Citizens for Good Government will once again present summary information from our Campaign Contribution Table shown below. Total campaign contributions of $246,306 were made during the past four years to our councilmen by contractors and subcontractors on whom the councilmembers are scheduled to vote at the February 19th council meeting. For the first time since CFGG has been presenting our campaign finance reports, Councilman Chris Roberts was NOT the councilman with the largest amount of contributions, but Councilman Mark Spears has this honor with campaign contributions of $56,091. Councilman Roberts was in second place with campaign contributions totaling $47,950. This McClintock guy is a more dangerous than Chris Roberts thinks plus he gives great business advice. Citizens for Good Government is jubilant over the selection of David McClintock as the new Inspector General for Jefferson Parish. After checking out the resumes of the three finalists and observing the public portion of their interviews by the Ethics and Compliance Commission, CFGG agreed that McClintock was the one we wanted for Jefferson Parish’s first IG. We were thrilled when the Ethics and Compliance Commission was equally impressed with Mr. McClintock and voted unanimously for him. The Ethics and Compliance Commission did an outstanding job in getting us to this point in the Inspector General selection process, and we are extremely appreciative of their hard work and conscientious effort. Since they are not compensated for doing this job, the reward for them will be what we believe is a gigantic step toward good government in Jefferson Parish. It is significant that our new Inspector General will be completely independent and is being financed without an increase in taxes, since his office will receive its funds from a rededicated millage. Although it took three years, Citizens for Good Government is thrilled at the results of our own quest for an Inspector General, and we believe it has been well worth it.